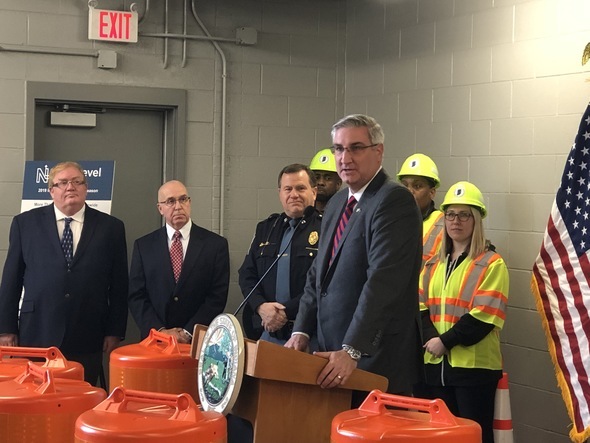 INDIANAPOLIS - Governor Eric J. Holcomb joined Indiana Department of Transportation Commissioner Joe McGuinness, law enforcement, and road construction industry partners today to kick off the 2019 Next Level Roads construction season. The kickoff event was held at INDOT's Office of Materials Management in Indianapolis. The office develops, inspects and tests materials used to construct and maintain highways to ensure products used are efficient and effective. INDOT is embarking on its second full year of delivering Gov. Holcomb’s Next Level Roads plan, which leverages long-term, sustainable funding to make record-setting investments in Indiana’s transportation system. More than 1,100 projects are scheduled for construction along INDOT routes in 2019. When combined with preventative maintenance activities, the state is investing more than $2 billion in its highway network this year. Gov. Holcomb’s Next Level Roads plan spends an estimated $10 billion on construction and maintenance of state highways over the next five years and more than $30 billion in the next 20 years. Additionally, INDOT is making available an estimated $140 million to help address winter damage for projects like repaving portions of I-465 in Indianapolis. With construction season kicking into high gear, Indiana residents and travelers to the Crossroads of America will see an increasing number of “Road Work Ahead” signs. 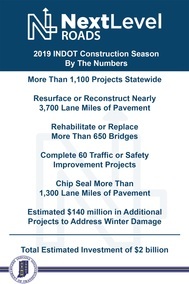 “INDOT is delivering a record number of projects in 2019 on top of many cities, towns, and counties that are also delivering more construction projects than ever before," INDOT Commissioner Joe McGuinness said. "In the short term, that means that Hoosiers will see a lot of orange barrels this year and should expect some delays. The payoff will be thousands of miles of smoother pavement and hundreds of improved bridges in all corners of Indiana." Hoosiers are encouraged to visit www.nextlevelroads.com to use INDOT’s Google Map tool to find projects happening near them. Motorists should also check INDOT's CARS program for real time-traffic conditions and construction project updates. To report a roadway concern, call 855-INDOT4U or visit www.indot4u.com. With the record breaking construction sites across the state, INDOT and the Indiana State Police are partnering together to remind the public about Work Zone Awareness Week. Hoosier motorists are encouraged to slow down, avoid distractions and drive with extra caution in work zones. Next month, in conjunction with a national awareness effort, Gov. Holcomb will declare April 8-12 Work Zone Awareness week to remind all drivers of their responsibility to keep work zones safe for workers and other drivers. You can help promote work zone safety by wearing orange on Wednesday, April 10. More information on work zone safety is online at http://workzonesafety.in.gov.